at SpaceLab. An XYZprinting Da Vinci 1.0 3D Printer, to be exact. And so naturally, the first thing I designed for it to print needed to be SpaceLab related. A keychain! If you have a Mac, want access to some fantastic software, and don't have $1,000 kicking around, then the Rhinoceros Mac beta is for you. It's totally free, assumedly while the beta goes on. Normal pricetag for this is over $1,000. Printing, particularly lettering, works best at around a 2" or greater build volume. At least on the Da Vinci, at 100 microns, decent print resolution works in that range. If you're unsure if the size of your designed object will work, print it out on paper at scale first, then cut it out to get a really good visualization. I'd never published something to Thingiverse before, but as of a day online, my design has already received several downloads and likes. This seems to be a great way to share designs and get noticed. 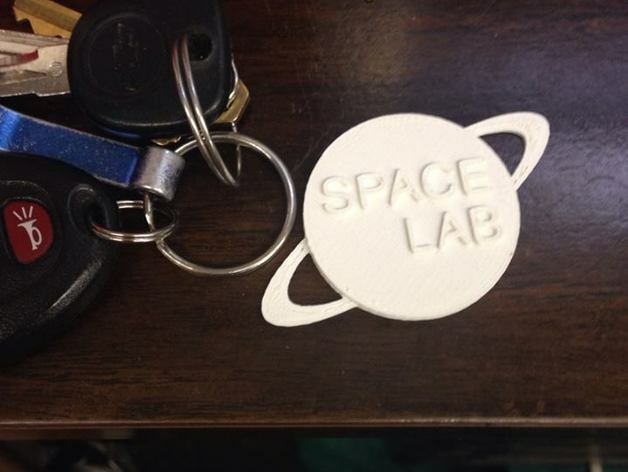 If you'd like to check out the keychain design, and any of my future objects, head on over to my Thingiverse profile.